Create a soothing look and sound in your office or backyard using the KelKay Pebble Cascade Fountain. The muted tones, smooth rock shapes, and exciting height on this unit lend a serene feel to any setting, enhanced even more by the moving water. A sturdy, square base with two arched corners creates a stable support for this piece, and also forms an inconspicuous water reservoir. Its vertical and horizontal lines and gray color evoke slate, and a center wall extends from this reservoir for height and drama. Its frame matches the base, with slightly curved sides for a modern hint. Faux pebbles occupy the center of this wall, their tan, brown, and gray colors bringing depth and drama to the fountain. Place the included, 155 gph pump in the water basin, and attach it to the preinstalled tubing. This submersible pump will move water from the reservoir to the channel at the top of the wall, were it will gently spill over for a soft and wonderful cascade, mimicking a vertical stream bed. A slot at the base of the wall allows water to reenter the basin, for a lasting water feature, and a flow adjuster at the front of the pump enables you to have just the right size waterfall. Made from resin, this hardy piece will look great outdoors through the warm months, or can easily adorn a lobby or home year after year. Its handpainted finish lends a unique look to each unit, while the texture adds striking realism. 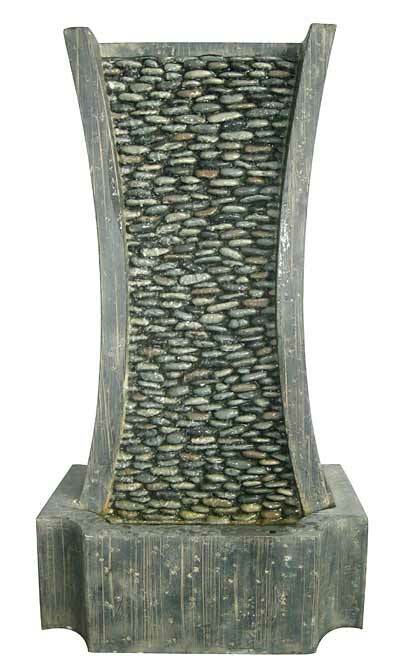 Place a stylish and serene water feature virtually anywhere using this Pebble Cascade Fountain.